An agreement curtailing Iran’s nuclear programme in exchange for the lifting of international sanctions could reopen the Iranian economy to Western exporters, creating opportunities but also risks. A historic agreement curtailing Iran’s nuclear programme in exchange for lifting sanctions could possibly be reached this summer but major political obstacles remain. If the deal is reached and honoured, the machinery, chemicals and transport sectors could see the most potential in exporting to Iran. A large, well-educated population also offers high demand for consumer goods, telecommunications and finance. The most notable risks are the violation of sanctions during the transition period, the snapback of sanctions should Iran not cooperate and the lack of credit information on Iranian businesses. On 2 April 2015 a framework agreement for a deal to curb Iran’s nuclear weapons programme was announced, igniting speculation over the potential lifting of sanctions should a final deal be reached by the end of June – let alone be honoured. Iran could be the last ‘untapped’ frontier market, offering billions of dollars of potential through the re-establishment of international trade with the Middle East’s second largest economy. But any deal will not provide a guarantee for a long-term solution and the transition will be a long and bumpy road. Therefore we advise patience and caution to firms interested in (re-)entering into business in Iran. Despite a more-detailed-than-expected framework deal put forward in early April and celebrations on the streets of Tehran, there remain many obstacles to reaching a final agreement by the end of June. One crucial issue is deciding when and how the sanctions will be dismantled. Iran demands an immediate lifting of all sanctions upon signing an agreement whereas the US and EU envision a gradual removal of sanctions as Iran meets its obligations. Besides the lifting of sanctions, what happens should Iran fail to comply at any point – will sanctions be immediately reinstated or will leeway be granted. This is also a contentious issue. At the centre of the debate however is domestic politics. For Iran’s clergy leadership, a nuclear deal spells a sort of paradigm shift from its nuclear development as a defence mechanism and its staunch aggression towards Israel and the West. Western politics are limited by how lenient politicians are willing to be with negotiations, which is growing more and more challenging as, for instance, the US Congress takes a new seat at the negotiating table. The nuclear framework negotiations are plagued by uncertainty and difficult political issues leaving the likelihood of an agreement still up in the air. But the ramifications of Iran re-entering the world economy and changing the balance of power in the Middle East are so large that it is already worth analysing the opportunities and risks. All but shut off from global commerce due to increasingly strict sanctions over recent years, trade with Iran could create tens of billions of dollars’ worth of business for local and foreign companies. The Iranian economy could be opened up to a gradual yet significant inflow of foreign investment. Iranian industry is currently operating at only 60% - 70% of capacity, suffering from outdated technology and an unstable economy due to sanctions. This deal would immediately boost the Iranian economy. Economic benefits would extend across the Gulf as well, particularly to Dubai or Oman, where Western businesses could establish themselves to go back into business with Iran. Iran is a primary exporter of oil and natural gas, but compared to the rest of the Middle East, the potential for diversification is very large. Agriculture and tourism in particular are potential growth markets. The race to modernise Iran would also spark large-scale investment in infrastructure. Chart 1 shows the five largest export markets for EU firms to Iran and how the export volume has changed from 2009 to 2013. The sharpest drops can be seen between 2011 and 2013 as the EU sanctions were put in place in 2012. Machinery and transport equipment as well as chemicals were previously the largest EU exports to Iran and we predict that these sectors would be the quickest growth markets for Western businesses stepping back into Iran. Iran’s consumer market is nearly 80 million people strong with the majority being well-educated and highly skilled. Consumer purchasing power is high with large demand for Western products – particularly consumer electronics, durables and services, telecommunications and finance – accompanied by low household debt thanks to the lack of credit cards and foreign bank activity. Prior to sanctions, Iran’s relatively stable domestic political situation and large consumer market made it one of the most attractive economies in the Middle East. 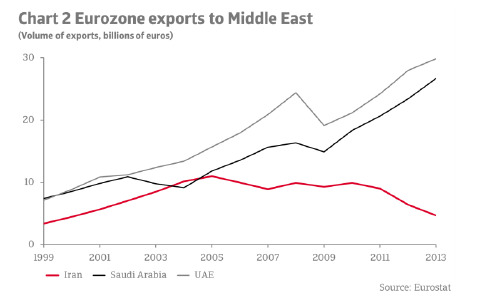 As can be seen in Chart 2, eurozone export growth to Iran showed a comparable trend to that of the UAE and Saudi Arabia, the two largest export destinations in the region, in the first few years of the century. Atradius’ total potential exposure in 2005 was EUR 272 million. However, 2006 was a turning point when the UN Security Council imposed sanctions on trade in nuclear-related materials and technology, that grew stricter as time passed, particularly intensifying in 2010. Western energy companies would be the first-movers into Iran’s market as the Middle Eastern country’s natural resource reserves are among the largest in the world. Furthermore, the re-entrance of Iranian oil exports to Western oil-importing markets would act as a lid on low oil prices, prolonging the economic boost that low oil prices have provided American and European firms. Finally, as demonstrated through previous business with Iranian firms before the latest series of sanctions, Iran has particularly strong payment morality. Speculation and uncertainty prevail in the nuclear deal talks and should an agreement and subsequent action go through, there remain many risks that those interested in doing business in Iran must be aware of. Under sanctions, some Iranian businesses across all industries have been able to establish relatively large domestic market shares in the absence of foreign competition. Should the deal go through, these firms will have very limited time to adapt and increase their international competitiveness. New competition arising from Iran’s entry onto the global market would also affect other Gulf states. For instance, Iranian oil exports to the West would be directly at the expense of Saudi exports, during a year of record deficits due to low oil prices. Arab stock markets are also in the process of reform, so Tehran’s well-developed stock market would compete for foreign capital. Entering the Iranian market should be done with extreme caution if the sanctions are lifted. Patience would be required through the transition phase as the complex web of international sanctions is unravelled. Exporters and investors could still face penalties for violating sanctions through this period. Additionally, sanctions unrelated to Iran’s nuclear weapons will remain in place. If Iran fails to meet its transparency and nuclear obligations, then the sanctions could be immediately reintroduced as has happened before. This could lead to billions of dollars in fines levied for sanction violations and also, as crucially, the re-establishment of banking restrictions effectively shutting down international monetary payments to and from Iran. This would make it impossible to collect from Iranian businesses, even if the firm is committed to paying its debt. Lots of uncertainty remains about Iran’s economy as well since little to no business has been done with the state under the sanctions. In terms of investment, although Iran’s economy is legally set up for foreign investment, the system has not been tested during the sanctions era. In terms of creditworthiness, there is little regulation and little financial information is available, especially within the SME segment, making it a daunting task for Western exporters to identify potential creditworthy buyers. Overall, despite the vast challenges to a final agreement, we see huge potential in re-establishing trade with Iran. Historically, it is a large consumer market with high demand for Western products and strong payment morality. Caution and patience should be taken in exploring opportunities for trade and investment however due to uncertainty over the final agreement, compliance with a final agreement, and lack of information on the Iranian market.